For the last month, I’ve been using my current Eberron game (with my most excellent Eberron players) to flesh out the sandbox for my first written and published module. Now, I’ve been running D&D for around 12 years properly, and other stuff before that. I’ve largely disdained module-based gameplay in favor of more open-world feels–but, with the advent of 5th edition and the creative spark from this blog (and our fans and feedback), I’ve taken the plunge to marry the two loves… modules and open space to run a game. Where that leaves me is our current project: a compendium and set of tracking tools for a party of 1st level adventurers to take on the role of guards in a conventional D&D world. It isn’t the first time a module has been designed with that in mind either implicitly or explicitly (I can think of a few), but where ours takes a detour is that the entire module is 12 days (in game) of play in one small city. The entire city moves on it’s own time-table and clock (the DM will be the one with the master tracker that will show what is happening in any given part of the city at any given point in that 12 day stretch). So, whether the player characters are over in Wetside on the morning of the fourth day, that fight that’s set to happen will occur. Those people will die. Those culprits will get away. And if not found by the evening of the seventh day, they will escape the city through the East Gate at midnight. There are several ways to work that event in the game, either by being close by when it happens (a chase and combat) or finding the criminals shortly after (investigation and diplomacy) or blind chance (plenty of other reasons to be at the East Gate on Day 7). But, regardless, that story comes and goes, and the player character may or may not touch upon it. Staying in one place (let’s say Gildt, the market square) for all 12 days (all day) will be a great way to interact with a dozen different stories and happenings. Some requiring criminal contacts, martial readiness, fine social skills, etc. and some requiring just sensible decisions (the party are guards, afterall, and knowing when to arrest and when to scold and when to restrain instead of kill are all worth XP). The NPCs run their part in the overall play and things done in game that may derail or negate a later story are worth XP as well (afterall, the street gang that gets busted and jailed can’t be there to pull the jewel heist later in the week). We have generated (and cross-referenced painstakingly) the first 18 of our target 36 storylines for 12 Days in Greyghast. This on top of building out the city with enough specifics to be able to use it as it’s own tiny campaign setting independent of any others as well as be able to drop the city-state itself into just about any world–right now, Greyghast is in Eberron, but there’s nothing that keeps it from existing in Forgotten Realms or other settings with ease. As the game is focused exclusively on the city itself and all adventuring is in town, there’s no great problem with the rest of the world being defined. The party found all sorts of new uses for hirelings. From bribing fellow guards to take prisoners in for them, once captured (to save time, and stay “out in the field” for more XP and stories rather than waste hours in transit across the city) to paying off snitches to buying some on the spot day labor when some of the plots had a lot of heavy lifting to do (one group paid commoners on the street to clear the refuse of a fallen building to save the family caught under the rubble rather than stay and do it themselves–they earned half the experience by outsourcing that part of the story, but were free to run off to do more work). The party used rests sparingly and seriously. Despite the warlock wanting a short rest, she insisted they keep going several times because the two hours or so of doing nothing may be just the time needed for a suspect they were trying to catch to get away or may make them too late to stop the cult they heard rumors about. They took more risks and leaned on each other more tightly rather than take turns taking the spotlight. More “help” actions, more sparing use of powers and abilities just in case they’d be needed in more dire situations later. The PC’s embraced the world thoroughly. 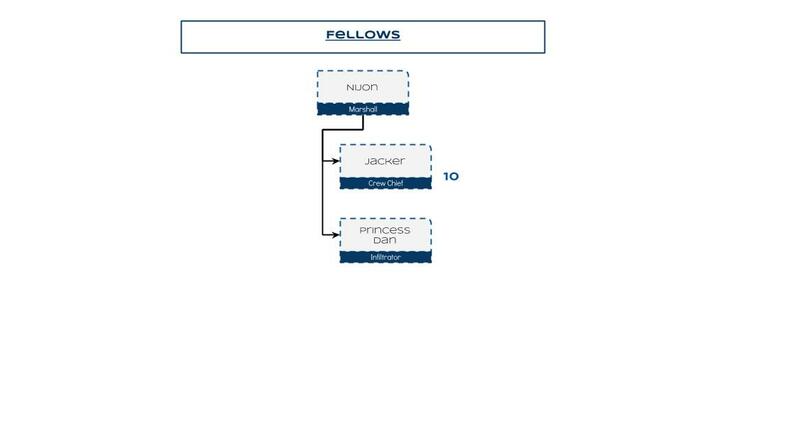 When you have your fourth story that runs through the same neighborhood and the NPC’s are clearly listed and easily accessed (we built a very quick reference for that), it meant they started cultivating relationships with the potter in Gildt because he’s open every day and had been helpful several times. They come to recognize the heraldry of some of the nobles and quickly memorize the taverns in town and understand the different clientele they’re likely to meet. Ultimately, it meant that they started adopting their guard role more deeply. Less likely to mouth off to the shopkeeper that’s just trying to make a buck (he might be a needed witness at some point), less likely to casually steal or commit violence (different districts of the city have different moods about guards and the worse the mood, the less helpful and often obstructive they can be). I saw a mixed group of PC’s grow more Lawful and Neutral and Good..
Backgrounds really shone. The former criminal-turned-cop used their Contacts to great effect and was instrumental in moving plots along most of the time. The noble was able to get the right doors open with little effort. The folk hero never had to spend a penny to get a good night’s sleep or a great meal in the common areas of town (and they were counting their pennies). I could go on, but I’ll be saving that for later. We’ll be putting up some snippets and snapshots of the project in the coming month. Our other updates have been infrequent this past month while we worked on this and our construction projects. Thanks for reading, look for more updates on this in the future. 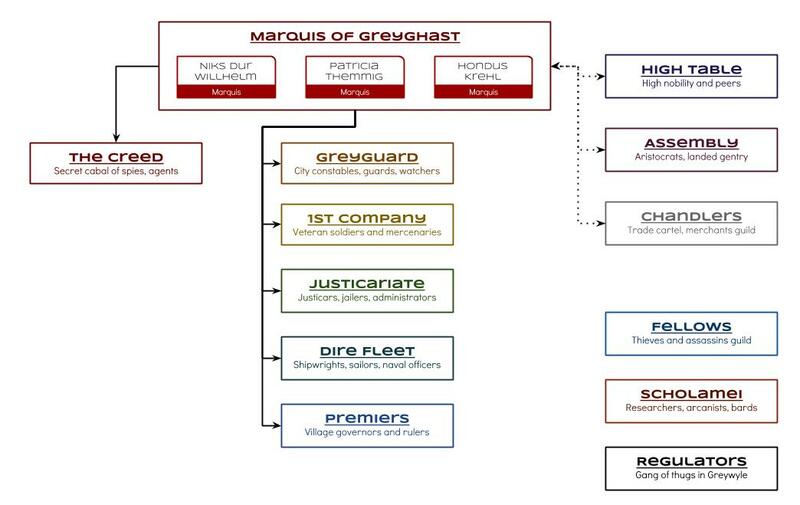 For now, I leave you with some of the organization charts for our fictional city. Without context they aren’t too useful, but may prove stimulating to your imagination for other reasons. This sounds very interesting. Looking forward to more details. On a separate note, how do you vote on the polls for th building a campaign from the ground up? I also can not fide a comment section on those posts.